Love Blackjack? Can’t get enough poker? Then you’re going to love the Blackjack 21+3 side bet. In a nutshell, it’s like playing a poker hand before you play your Blackjack hand. In Blackjack, you’re dealt two cards face up and the dealer receives two cards, one of which is face up and the other of which is face down. Not counting any other players at the table, there are three face up cards — your two face up cards and one of the dealer’s cards. Assuming you’ve placed the side bet, you’ll get paid out if you’ve hit anything with those three cards. If you haven’t, you’ll lose your bet and carry on with your game of Blackjack. These payouts seem really amazing, but the odds of actually hitting that flush, let alone anything else, is pretty low. Like all side bets, the house edge is usually pretty high. The payouts are attractive to get you to ante up, but the odds of winning will more often than not see your hard earned money being flushed away. Unless, of course, you have a strategy. And we’re not talking about a run-of-the-mill betting strategy. We’re talking about card counting. 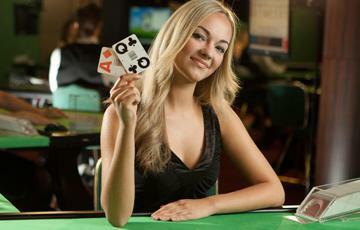 New to card counting? Intimidated by it? We don’t blame you. It’s not exactly easy trying to count cards in your head with so much chaos around you, all the while trying to avoid being detected by the pit boss. The most serious card counters — the guys from MIT who swindled Vegas casinos out of millions — those guys practiced like their lives depended on it (and judging by how Vegas is famous for breaking kneecaps, it probably did depend on it). But while counting cards is complex, especially since you have to keep track of various numbers, counting suits is a lot easier. Start by picking a suit. Let’s choose diamonds for argument’s sake. You’re going to start with the number 0. Each time a diamond is dealt, subtract 1 from your total. Each time four cards are dealt, add 1 to your count. When 52 cards are dealt, that’s one shoe. Divide your current count by how many decks are left in the shoe. When your count hits either +4 or -5, it’s prime time for placing that side bet. You’ll find that it’s super easy to count suits because the number hitting the felt doesn’t mess with your count as much. The only problem is by only counting one suit, you’re limiting yourself to winning with just 25% of the cards in the shoe. For that reason, consider counting as part of a team. Just try not to get caught.